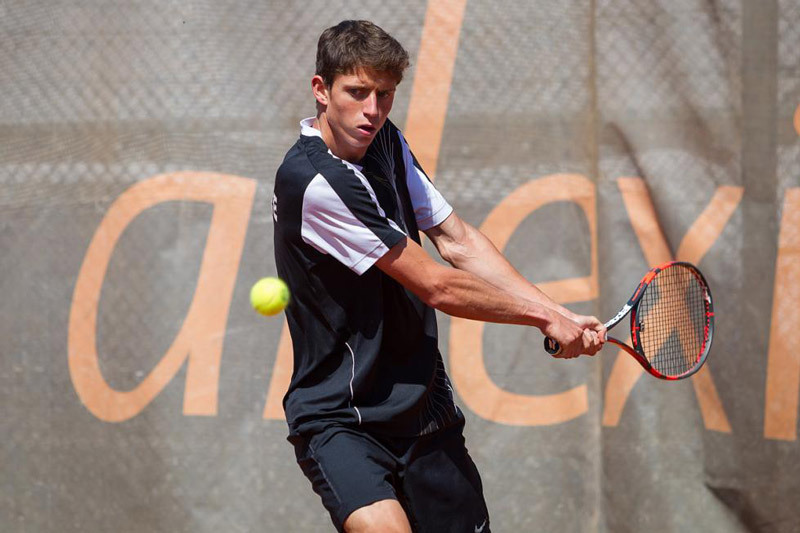 Danylo Kalenichenko, member of LOVE 4 TENNIS Academy, should not have played at Peugeot Slovak Open in Bratislava, but in the end he joined the qualifying and made his way through into the main draw of this indoor tournament. Danylo Kalenichenko, member of LOVE 4 TENNIS Academy, should not have played at Peugeot Slovak Open in Bratislava, but in the end he joined the qualifying and made his way through into the main draw of this indoor tournament. Danylo beat Slovakian Habrman first, then Croatian Veic and in the qualies final he won against Polish Gawron. Gawron and Veic were before both much higher in the ATP rankings, on 262th and 119th position. “Danylo surprised me a lot, although he showed good form in training last Thursday and Friday. He beat doubles specialist Igor Zelenay in training match. I have seen his uprising form,” said about his progress coach Jan Stancik. Interestingly enough, Kalenichenko should not have played at the tournament at first. “Michal Fasung from L4T withdrew because of injury and Danylo was the first substitute. He was looking forward the tournament, because it is higher level of tennis. Ball boys are present, linesmen. It suits Danylo much better than Futures tournaments. We had higher expectations from this season. I hope he can show all the hard work we have put into training to tournaments like in Bratislava,” wishes Stancik. Kalenichenko‘s ambitions are very clear, in 2015 he would like to reach TOP 500 in singles ranking. In doubles he reached his career highest ranking already, 475th, after playing final and semifinal in Futures tournaments in Minsk. “I am surprised and mostly pleased that I could reach the main draw at such good quality challenger. I had good feelings before the tournament, I played well. I mostly appreciate win over Veic, he is close to the Top 100 in the ATP rankings. All went well in this match. I was tired when playing Copil, one rest day would be great. I was not stressed, I enjoyed it. My service game did not work in first set. That was decisive. I think it can get me started, with those five points at the end of the season. I really want to reach Top 500. I hope I can build on this result, to be the turning point,” added Kalenichenko, who is now going to play at two 10K tournaments in Czech Republic.